Two reports came out last week that can easily lead one to opposite conclusions about the current state of hospice care in the U.S. The first was a Wall Street Journal (WSJ) report on how hospice care is being used too early in the course of a Medicare beneficiary’s illness. The article can pretty much be summarized by its subheading: “More dementia patients and others who die slowly are receiving care, causing costs to rise." NHPCO has a good response to the article, which I will not summarize here except by saying that my favorite line from it was : “People do not come with an expiration date, nor does their end-of life-care.” While I agree with NHPCO's response, I still found the WSJ article fascinating, in particular the finding that beneficiaries who were enrolled in hospice for more than 365 days accounted for about 32% of Medicare hospice payments. More striking is that those with very long lengths of hospice lengths of stay (on average 1000 days) accounted for a very small proportion of hospice patients (1%) yet resulted in 14% of Medicare’s hospice spending. The second report that came out is from the Dartmouth Atlas Project and sponsored by the Hartford Foundation. Karl Steinberg wrote a post about the new report on Pallimed, which I will not rehash here. But I will say that I’m most struck with the report's conclusion about hospice care in the US: “the data in this report suggest that we are still waiting too long to refer patients to hospice care.” More specifically, they found that 16.8% of Medicare decedents were enrolled in hospice care within three days of their deaths, a number that varied more than fourfold across hospital referral regions. So, which is it? To soon? Too Late? 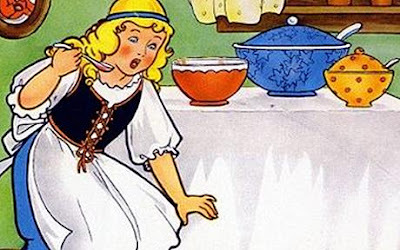 In the fairy tail Goldilocks and the Three Bears, Goldilocks found the porridge that was right for her, something that was not too hot and not too cold, but just right. It may seem reasonable then to want the same thing that Goldilocks deemed optimal. But really, who cares what Goldilocks thinks? It was never her damn porridge to start with. The chairs, the bed, and the porridge were all designed for the needs of someone else. And look what happened to her. She ended up jumping from a window and is never heard or seen of again. No, what we really need is to say good riddance to Goldilocks and think long and hard about who should really be deciding what is just right. Hospice was built on the idea that people were doing well (what I've termed "temporarily immortal") until they were on an evident decline with "terminal illness" and were "dying." Think about the "turn from cure to care" language. And that can be true in some disease courses - but it is more and more a minority experience. Most people now spend a long time on a tightrope of narrowly balanced survival with multiple degenerative chronic conditions, and the timing of death becomes quite unpredictable. Hospice practice and regulation have always been silent as to the "correct" error rate on that 6-month survival prediction and the relevance of long survivals past 6 months, so we don't even have a standard by which to judge. Therefore, areas with very weak long-term care use hospice as a worthy substitute and get those very long stays that are legitimate (the ones that can be known to be fraud are a different category). One of the core problems is that policy has not dealt with long-term care, and, for that matter, neither has palliative care. Yet, most of us will spend most of our lifetime costs in the period of needing ADL assistance in old age - a period for which society has not come to terms with the needs or how to meet them. Hospice late and early admissions is just a symptom. It would be significant to know how many of these long-term hospice patients are residents of Skilled Nursing Facilities. Hospice was originally intended to help families caring for terminally ill at home and would not seem to be needed at a fully staffed facility. Enrolling residents of such facilities in hospice provides additional nursing personnel, thus reducing the SNF's cost, while the hospice collects from MEDICARE. The family is spared some of their expense. Everyone gains - except the taxpayer. It is no wonder that for-profit hospice organizations focus their marketing on nursing homes. The WSJ article, and responses to it, suggest to the casual reader that hospice CARE has been inappropriate. If the care were described as palliative, rather than hospice, I doubt there would be much (if any) of a discussion about its inappropriateness. What is in question is the appropriate timing of the use of the hospice BENEFIT. Once again, we do ourselves a disservice by conflating palliative and hospice CARE. The differentiation we should be making is between palliative CARE and the hospice BENEFIT. This is really a tale of two tails and it is a bit disappointing that different stakeholders are focused on these different ends and largely talking past each other. Policymakers and budget hawks a la the WSJ look at the long tail, which has been fattening, and react to the added cost to Medicare. Moreover it is somewhat a dubious cost with evidence that the fattening of the tail is more likely in for-profit hospices and low intensity cases and/or people with the support of a SNF. Looks like profiteering. Although is should be noted that health care and long-terms care in general are poorly suited to the needs of older' adults with dementia and their families and caregivers are understandably desperate for help. On the other side, super short stays may also be wasted effort as well as reflecting weak prognostic or communications skills on providers and systems. But the most important number is the MEDIAN which I believe is still around 16 days. My sense is the this is too short as well. But as Joanne observes re the error rate, I've never heard anyone suggest an optimum target LOS. Still with the median being this short, concerns about the share of costs driven by extreme stays are just wrong headed as they are necessarily affected by the naturalistic fallacy - i.e., that what IS is what OUGHT to be. When the majority of people have stays that are probably too short, we just don't have the right baseline to interpret super long stays. I think we can say that the hospice program SHOULD be a lot more expensive than it is for the majority of people it serves. I think that both articles are true. Some people look at hospice as a way to get someone to come in and give their person a bath twice a week, either because they can't afford home care or simple because they can't do it themselves. Some people who could afford home care are just cheap, or feel entitled because they paid into Medicare, so they deserve it. Plenty of others just cant deal with the fact that their family member/loved one is dying. One way they deny it is simply by not calling on hospice till the end, end. what's the answer? Beats me! The problem could simply be human nature. Some people are cheats or "entitled". Some people deny what's right in front of their noses. So, we have met the enemy, and he is us!